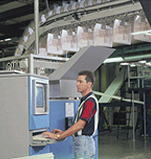 Our bindery/mailroom is unrivaled in our region and features two high speed saddle stitchers, a perfect binder, two inserting machines, and inkjet and traditional labeling equipment. Our two Muller Martini saddle stitchers each have six pockets and a cover feeder and our Muller Monoblock perfect binder has 18 pockets and a Kolbus 3-knife trimmer for those publications and directories that require a perfect bound finish. With our inserting equipment we can insert free standing inserts into half and quarter-folded press products at speeds up to 30,000 copies per hour. Our GMA SLS2000 handles the half-fold work and our Kansa equipment easily takes care of the quarter-folded publications. We are fully equipped to handle and process bulk mail and we have the expertise to ensure that your mailing will always meet the postal requirements. Our Video Jet 4000 equipment can be used in line with the GMA inserting equipment and our Cheshire labelers allow us to apply traditional labels if preferred.